The White enjoys a paradisiacal location in the pretty village of Imerovigli, on top of the caldera, a short distance from the main square. This junior suite features a queen-size bed, COCO-MAT brand sleeping products, design furniture, a separate living area, and a luxurious 10 m² bathroom with a shower cabin and high-quality toiletries. 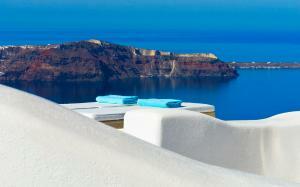 It also offers access to a shared terrace of 80 m², with views of the caldera, the Aegean Sea and the sunset. The terrace is located in front of the main pool of 20 m². The suite is on the ground floor and can accommodate 2 guests. The suite has a private area, but is not isolated and is visible to other guests. Elegantly decorated suite with a private 40 m² terrace with private heated 12 m² pool, private entrance and views of the caldera and the Aegean Sea. It has a large round wooden bed, sleeping products of the COCO-MAT brand, designer furniture and a tile bathroom of 5 m² with a shower cabin and luxury toiletries. The suite is on the top floor and can accommodate 2 guests. The accommodation has a private terrace, which is visible to other guests. Overlooking the caldera and the Aegean Sea, this suite is elegantly decorated and features a private furnished terrace of 20 m² with a private spa bath of 3 m² (not insulated). The suite features COCO-MAT brand sleeping products, designer furniture, a living room with an integrated sofa bed, and a mosaic bathroom with a shower cabin and luxury toiletries. The suite is located on the top floor and has a maximum capacity of 3 people. The suite includes a private terrace, but is not isolated and is visible to neighbors. This elegantly decorated suite has a private 5 m² pool or a private 3 m² spa bath (not isolated). It also offers access to a shared terrace with views of the caldera and the Aegean Sea. It has sleeping products of the COCO-MAT brand, designer furniture, separate seating area and a private and luxurious 10 tile bathroom, with a shower cabin and high-quality toiletries. The suite has a private area, which is visible to other guests. This elegantly decorated suite has a private terrace with a private 6 m² spa bath and direct views of the caldera, the volcano and the Aegean Sea. It has a large round wooden bed, sleeping products of the COCO-MAT brand, designer furniture and a bathroom of 5 m², with a shower cabin with mosaics and luxury toiletries. The suite is on the top floor and can accommodate 2 guests. This suite is elegantly decorated with luxury Mia Collection furniture and consists of 1 master bedroom with ensuite bathroom, second bedroom with private bathroom, and large living room with integrated sofa bed. The suite opens onto a private furnished terrace with a private hot tub (not isolated) and overlooks the caldera and the Aegean Sea. It can accommodate up to 5 people in this type of room.